Roadside bombs in southern Afghanistan on Sunday left seven NATO soldiers dead, the alliance said, as its forces continued an anti-Taliban offensive in the world's most fertile opium-producing region. 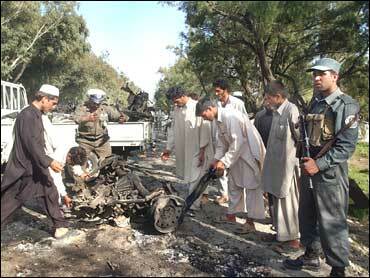 One roadside bombing killed six NATO soldiers dead and wounded another, the alliance said. A separate roadside bomb killed one NATO soldier and wounded two, while a clash in the east left two Afghan guards and two militants dead, officials said. NATO's International Security Assistance force did not identify those killed and wounded or specify the locations of the explosions. The driver was beheaded. Mastrogiacomo, who worked for the daily La Repubblica, was released March 19 in a much-criticized swap for five Taliban militants. "We asked for two Taliban commanders to be released in exchange for Ajmal Naqshbandi, but the government did not care for our demands, and today, at 3:05 p.m., we beheaded Ajmal in Garmsir district of Helmand province," said Shahabuddin Atal, who claimed to be a spokesman for regional Taliban commander Mullah Dadullah. The report could not be independently confirmed. "When we demanded the exchange for the Italian journalist, the government released the prisoners, but for the Afghan journalist, the government did not care," Atal said. Interior Ministry spokesman Zemeri Bashary said police have no evidence yet that Naqshbandi was killed. Another Taliban spokesman who frequently speaks with the media, Qari Yousef Ahmadi, said he was not aware of the killing. La Repubblica's editor, Ezio Mauro, said in a statement on the paper's Web site that the newspaper staff was "living through hours of anguish" after news of the interpreter's purported execution. The statement said the paper had asked the Afghan government "to do everything it maintains is right and possible to safe his life." The prisoner swap that secured Mastrogiacomo's release has been heavily criticized by Afghan lawmakers and foreigners working in Afghanistan as an incentive for more militant kidnappings. In the eastern Paktika province, two Afghan guards were killed and five wounded during a four-hour firefight with Taliban militants near the border with Pakistan, according to the U.S.-led coalition, which is operating separately from the NATO-led force. Militants fired mortars and a rocket on a coalition checkpoint in the village of Kakakhel. Troops returned fire and called in an airstrike, leaving two militants dead and three others wounded, the statement said. Also Sunday, in the eastern Khost province, a gunman riding on the back of a motorcycle opened fire on Afghans working for ISAF, killing two of the men and wounding another, ISAF said in a statement. And in the eastern Nangarhar province, a suicide car bomber blew himself up next to a U.S.-led coalition convoy, said Ghafor Khan, spokesman for the provincial police chief. One soldier sustained minor injuries, a coalition statement said. The latest violence came days after more than 1,000 NATO and Afghan troops retook Sangin district in the opium-producing Helmand province. The next step will be for NATO to hand over control of the area to Afghan security forces, Carl said, adding that NATO already has transported about 500 Afghan forces to the south. The operation to retake the town from militants started late Wednesday and is part of NATO's largest ever offensive in Afghanistan, Operation Achilles, launched last month to flush out Taliban militants from the northern tip of Helmand province. About 4,500 NATO and 1,000 Afghan forces are in and around Helmand province as part of Operation Achilles. In the last several months, Taliban militants and foreign fighters have streamed into the province, according to U.S. and NATO officials.